Queen Elizabeth I (1558–1603) was the first monarch whose Accession Day on 17 November (the day when Mary I died and she became Queen) became a yearly occasion for celebration. Although never at official holiday, at Whitehall, noblemen honoured Elizabeth’s Accession Day with a tournament open to paying spectators, followed by a private banquet and entertainments in the evening. Across the country there was bell-ringing along with prayers, sermons, bonfires, the giving of alms, and even pageants performed in the streets. Poetic tributes to the day frequently evoked images of singing, music-making and dancing. George Peele’s poem Anglorum feriae (1595), for example exhorted nymphs: ‘paeans singe and sweet melodious songs; / Along the chalky cliffs of Albion [England]’ and described how ‘court and country carol in her praise / And in her honour tune a thousand lays’. This all-encompassing harmonious image was far from reality, however. The occasion was never uniformly celebrated. Some localities never honoured the day, while others did no more than ring their bells. Church services, when held, were not necessarily well attended, while few towns put on civic festivities and these were not held every year. Moreover both Puritans and Catholics complained that the celebrations were idolatrous in their worship of Elizabeth. Nevertheless, this musical imagery was not merely political metaphor, but inspired by the social phenomenon of Accession Day singing around the kingdom that had been developing since the late 1570s. Many songs would have circulated orally and been learnt by copying the ballad-seller or through communal singing in church, home or alehouse. Some, however, can be traced in extant manuscripts, single-sheet broadside publications, prayer books and records of further, now-lost publications in the Stationers’ Register (a record book in which publishers could document their right to print a particular publication). Such genres spanned diverse social classes and contexts: from the educated to the illiterate, from street to church; from private household devotions to civic festivities. At times this singing was was officially encouraged by church and government, but it was also fuelled by the local enthusiasm of civic or parish authorities, individual households and commercial printers. The first known Accession Day songs appeared in a series of official prayer books that provide the format for special church service to commemorate the day (A Form of Prayer, with Thanksgiving, to be used Every Year, the .17. of November). The 1576 edition merely appointed to psalms to be sung, but the following year the royal printer, Christopher Barker published A Prayer and Also a Thanksgiving unto God for His Great Mercy in Giving, and Preserving Our Noble Queen Elizabeth for Accession Day 1577 by by ‘I. Pit, minister’, which provided a specially created text designed to be sung to the tune coin churches for for Psalm 81. By the time of the 1578 edition of the Accession Day service book (the twentieth anniversary of Elizabeth’s Accession) it contained three more special songs, two to be fitted to psalms and one with the tune unspecified but suggestive of a carol tune with refrains. Congregational singing was a remarkable new tool for promoting a sense of communal harmony in the post-Reformation Church and now it was being applied politically to bring together the subjects of a kingdom in loyalty to their monarch (and Head of the Church) on Accession Day. Commercial printers too capitalised on the anniversary by providing their own songs, including the printer Richard Jones with A Song for Each Subject that in England Bear Breath (1578, no longer extant). Other printers aimed at a more elite audience. For the 25th anniversary in 1583, Abel Jeffes printed William Patten’s Ann: Foelicissimi Regni Reginae Elizabeth: XXVI which included a Latin psalm alongside the English version adapted for the occasion and printed a tune for it to be sung to (a rare occurrence in single sheet songs!) Nor was this singing necessarily restricted to Protestant households. The manuscripts of Edward Paston – a Catholic who maintained a Mass centre at Appleton – contain three versions of William Byrd’s consort song ‘Rejoice unto the Lord’ which commemorated 28 years of Elizabeth’s reign and was probably originally composed for celebrations at court in 1586. Religion, it seems, did not prevent the Pastons from joining the festivities – despite their obvious Protestant tone. From the late 1580’s Accession Day song publications were both more frequent and more widespread, with eight different printers issuing song sheets in the final 15 years of the reign. This market for songs seems to indicate the popularity of celebratory singing among the population, beyond the official songs of the Accession Day prayer book. Furthermore these commercially printed songs were now less overtly religious in tone than those from earlier in Elizabeth’s reign. Rather than being described as ‘psalms’, ‘prayers’, ‘godly ditties’ or ‘anthems’, they were now simply ‘ballads’, and rather than place their emphasis on praising or thanking God, these songs now declare that they will show ‘the happiness of England for her majesty’s blessed reign’ or tell of England’s ‘abundant blessings’. Similarly, psalm tunes were being replaced by ballad tunes. A Pleasant New Ballad of the Most Blessed and Prosperous Reign of Her Majesty for the Space of Two and Forty Years (1600), copied into the Shirburn ballad collection, was sung to the tune of ‘The Queen’s Hunt’s Up’. The lyrics evoke the bells and drums typical of civic festivities that might be held in celebration, which were also spreading as Elizabeth’s reign progressed. The following verses describe Elizabeth’s achievements as queen, including how she has defended England with naval forces, maintained castles and fortifications, and been called to help foreign kings. A Pleasant New Ballad of the Most Blessed and Prosperous Reign of Her Majesty for the Space of Two and Forty Years (1600), first stanza, as it could be sung to one of the many versions of the ‘The Hunt is Up’ tune. Yet the paradox is that as Accession Day singing seems to have been increasing in popularity, England was becoming less and less harmonious society. The 1590s brought successive harvest failures, sharp rises in food prices, outbreaks of disease, heavy taxation, increasing crime and unemployment, intensifying factional rivalries at court and signs of civil unrest in the country with London riots and a failed uprising in Oxfordshire. Yet there was no obvious decline in civic celebrations or song publications, which continued until the very last year of her reign. Should we see this singing then as a genuine expression of an existing social harmony or as an attempt to create such unity in the face of mounting unrest? The expanding market for printed Accession Day songs was now commercial rather than governmental, responding to the popular mood rather than official direction. The growth in civic festivities, however, was led by local authorities. The increased potential for disorder may have caused civic leaders to see Accession Day as an important occasion on which to reinforce a sense of loyalty to the queen in the hope of maintaining order. Elizabeth’s popularity need not have been great for people to have welcomed an opportunity to liven up a cold, wet November. Nor was singing necessarily an unqualified expression of English harmony. The more insecure a community feels, the greater the need for people to assert their unity, even though this may be more hopeful than actual. As foreign threats and domestic difficulties increased, there was perhaps a growing need to believe in England as a harmonious kingdom unified by its queen. A subtle mixture of continued royal esteem but growing anxiety, of popular will and encouragement from local leaders, is the most likely explanation. You can find out more about music-making for Elizabeth’s Accession Day in my article: ‘Creating Harmonious Subjects? Ballads, Psalms and Godly Songs for Queen Elizabeth I’s Accession Day’, Journal of the Royal Musical Association 140 (2015), 273-312 (available here). 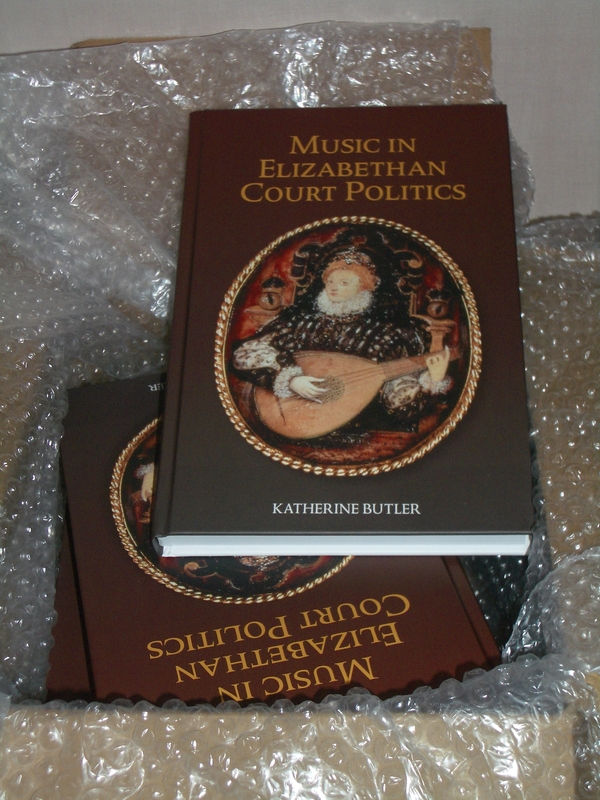 My book Music in Elizabethan Court Politics has just been published! In the book I investigate the political roles of music (particularly secular music-making) within the court of Queen Elizabeth I. IT’s begins by considering the musical reputation of Elizabeth herself. Did being a musician, music-lover and patron assist Elizabeth in projecting an image of authority, or did it leave her open to accusations of frivolity or even lust (as it often could for musical women)? Whom did Elizabeth choose to perform for and why? How might her performances for ambassadors have influence the course of negotiations – particularly those surrounding her marriage? Also politically significant was Elizabeth’s patronage of musicians: she employed a large number of musicians in both her household and her chapel who performed during court ceremonies, or festivities such as plays, masques, and dancing. In addition visitors often noted the luxurious and unusual instruments that were displayed throughout her royal palaces. Yet one of the key themes about the book is that music at the Elizabethan court was not solely under the Queen’s direct control. Courtiers, noblemen, even the performers themselves all had influence over the music performed and the politics messages they conveyed. Courtiers who were intimate with the Queen might write lyrics and have them set to music if they thought they were in danger of losing her favour. Others took their opportunity in the tiltyard. Taking on a personal knightly persona they dressed up in elaborately themed armour travelling on a pageant car with a train of followers to present they personal shield to Elizabeth, all to the accompaniment of music. This pageantry before the jousting and other military sports began often revealed much about the nobleman’s political interests, the image of noble masculinity he wished to create, and his relationship with Elizabeth. Elizabeth’s summer progress – tours through parts of her realm – opened up further opportunities for political music-making, both by courtiers and those usually more remote from the court. Elizabeth visited the estates of noblemen and made royal entries into towns. She not only visited loyal servants but also those whose activities were more suspected – Catholic gentlemen such as Lord Montague at Cowdray, or the Earl of Hertford who had earned royal displeasure by marrying a lady with royal blood without the Queen’s permission. These were vital occasions when the host (civic or noble) had the Queen’s attention and could make personal petitions or aim to influence her political policies. Music and song punctuated the elaborate entertainments that both towns and noblemen prepared for their Elizabeth, and these were always coloured by the politics of the occasion. Songs flattered the Queen, petitioned her for favour and rewards, made last-ditch attempts at wooing Elizabeth on behalf of suitors, and even criticised her policies and attitudes. All the while the musicians employed in these events had their eye on earning lucrative rewards or even a royal appointment. I hope this has given you a flavour of some of the fascinating research behind this book. It paints a fascinating picture of how music served as a valuable means for both the tactful influencing of policies and patronage, and the construction of political identities and relationships. In the Elizabethan court, music was simultaneously a tool of authority for the monarch and an instrument of persuasion for the nobility. The Earliest Surviving Song in Praise of Queen Elizabeth I? Until death us two depart. With the character of Merry England, Birche looks ahead to a new golden age of English prosperity. Yet the ballad presents a complex and paradoxical set of relationships between Bessy and England: she is England’s ‘dear lady’, lover, wife and heir. Elizabeth’s role as lover and ‘dear lady’ suggests the same true affection between kingdom and monarch evoked by Mulcaster. This is followed by the bond of marriage, suggesting the official coronation ceremony that has bound monarch and country and in which the monarch also received a ring. This metaphor of a monarch marrying their kingdom dated back to at least 1300, and had been employed by Elizabeth herself in her speech to Parliament in 1559 . Finally her representation as heir underlines her legitimate claim to the throne. The emphasis on her Englishness both distanced her from her sister, Mary I, who was popularly perceived as Spanish (because of her Spanish mother and marriage to Philip II), and also used her subjects’ sense of national identity to encourage a bond of loyalty with their new queen. For the wealth of all Christian lands. What does this song represent? Was this official propaganda instructed by Elizabeth or a member of her government in a format that could carry across the country as both printed broadside and orally-circulated song? Or was Birche’s song an enthusiastic outpouring from an enthusiastic Protestant thrilled to be rid of the Catholic Mary and hoping to gain some early favour with the new Queen? Birche’s Protestantism is evident from his other godly ballads: A warnyng to England, let London begin:To repent their iniquitie, & flie from their sin (1565?) ending with a prayer for Elizabeth; The complaint of a sinner, vexed with paine (1563? ); and A free admonition without any fees/To warne the Papistes to beware of three trees (1571) which ends with a resolute ‘God save our Queene Elizabeth.’ Or are we perhaps in danger of being taken in by the very rhetoric of mutual love Birche’s song pours forth? One can hardly imagine Birche being allowed to print (and reprint) a song that goes as far as putting words in the Queen’s mouth if it did not at least have royal approval. Yet if it was officially instigated by Elizabeth’s government, it was not a strategy that Elizabeth was quick to repeat. Not until 1577-8 were official broadside songs of praise produced, this time by royal printer Christopher Barker to commemorate her Accession Day on 17 November. These, however, were sung prayers and thanksgivings of a more sober nature than Birche’s charming dialogue. Whether officially instigated or merely royally approved, Birche’s ballad certainly started the process of constructing and disseminating across the kingdom aspects of the royal image that were to become characteristic of her reign: Elizabeth’s status as one divinely appointed by God and under his direct protection, and the ideal of a mutual affection between the Queen and her subjects. 3. William Camden, Annales, The True and Royall History of the Famous Empresse Elizabeth. Queene of England (London, 1625), p.28; Judith Richards, ‘Mary Tudor as “Sole Quene”? : Gendering Tudor Monarchy,’ The Historical Journal 40 (1997): 895-924 (p.912). In 1570 Thomas Vautrollier printed his Recueil du mellange d’Orlande de Lassus , a collection of Lassus’s chansons. It was only the second music publication to be printed in England (aside from psalm books) and it had been forty years since the last one (known as the ‘Twenty Songs’ and published 1530, though only the bass partbook and a few fragments survive). Vautrollier was a Huguenot seeking refuge from religious persecution in France. He saw Elizabeth’s England as the fulfilment of the ideal of concordia discors (harmony of discords) in its religious tolerance, and even dedicated his print to the Earl of Arundel, a musical patron with Catholic sympathies. Praising the ‘admirable beauty of the harmony’ in states that temper the ‘unified diversity of their various parts’, Vautrollier compared Elizabeth’s England to a musical motet in which ‘thanks to the leading of one part, all others hold to a similar measure’, making no discord despite their differences. Elizabeth is the leading part that keeps all the estate and religious faction in harmony. To Vautrollier, Elizabeth’s kingdom was an example to other nations of how a diversity of peoples can be skilfully governed to produce a stable and secure society. I was researching musical performances by Queen Elizabeth I (1558-1603) when I stumbled across John Davies’ poem, ‘To the Queen’ in the front of Roy Strong’s The Cult of Elizabeth (p.10).Davies’ poem characterises Elizabeth’s reign though a series of musical metaphors. While there has been extensive research into Elizabeth’s royal image, and while Elizabeth was widely known as a musical monarch (she played the lute, virginals, sang and even claimed to have composed dance music), the role of music in representations of the Queen had received surprisingly little comment, and so I began to look for other examples.